"Tita knew through her own flesh how fire transforms the elements, how a lump of corn flour is changed into a tortilla, how a soul that hasn't been warmed by the fire of love is lifeless, like a useless ball of corn flour." These tortilla chips are fantastic. Much crispier than the ones you buy in a bag and you can flavor them with anything you wish � chili powder, cumin, Creole seasoning, salt, pepper, curry powder, garam masala � the list is endless. They are a snap to make and a lot cheaper than store bough chips. Cooked tortilla chips will keep well, tightly sealed in a ziplock bag, just 2-3 days and are best fresh. Cut each tortilla into 8 pie-shaped slices and spread onto baking sheets in a single layer. Lightly spray both sides with cooking oil. 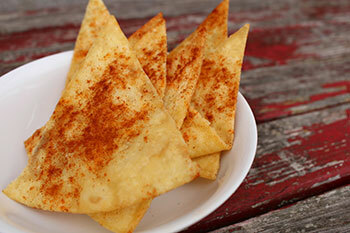 Sprinkle the salt over the tortilla slices and add pepper (or your spice of choice) to taste. Bake for 10 to 14 minutes or until chips start to turn light brown.